What are the best recipes on the meal plan? My favourite recipes in the meal plan are the vegetable fritatta as it is easy and you can add other veggies you like and it always comes out beautiful and is great for any meal. The peanut butter chicken is delicious and fresh. 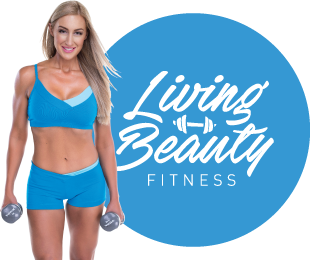 The Living Beauty berry choc protein bar is a tasty snack which you don’t have to feel guilty about. What I love about these meals is that they don’t taste like your missing out. Amelia designs everything for my specific needs, as when I started with Living Beauty a previous injury had left me with a sore back. My program includes resistance training, weights and cardio….and yes burpees really get your heart pumping. You know you have had a good workout when you have sweat running down your face! How have you found posing class to improve confidence? Posing classes have helped me become more confident on stage and really think about why I’m competing and making the most of the day. It sounds terrifying going on stage in front of so many people in a little bikini, but Amelia has helped me pose with class and confidence and be happy and proud of my achievements. How have you found Pilates? Amelia’s pilates class is something I look forward to on Saturday mornings. My body and mind feel both relaxed and energised and such a great start to the weekend. I have found pilates to be quite challenging when done with proper technique. I love the fact that I can make it that little bit harder for myself. Finding that mind to muscle connection has helped me with other aspects of training, especially training my core.